75% Thought and 64% Action! Good for you! You take your responsibility as a citizen seriously, and you are willing to go out of your way to try to make a difference. You pay close attention to issues that matter to you, and aren't afraid to take action. You invest both time and money in political and social causes. You are very well-informed and care deeply about the world around you. You may prefer spending time with friends who are political allies sometimes, because it's nice to be around people who share your passion. 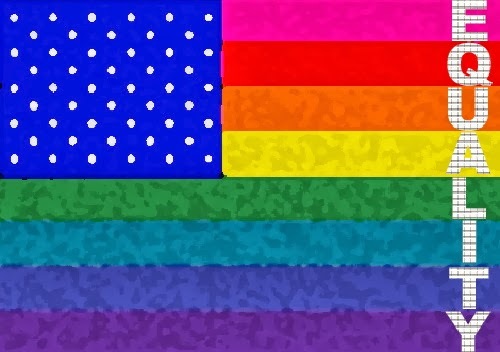 When you are in the presence of non-allies, you do not quietly suffer their bogus rhetoric. Thanks for taking my quiz! Thought this was a fun quiz - see if you are more committed than I am! OK, here's another one I really liked. Try it for yourself! It is Friday and I am wasting my last moments at work to take silly quizzes. Have a great weekend everybody! What Beer Would You Be if You Were a Beer? About every 5 or 6 years, I am called for jury duty in my home county of Essex in New Jersey. My first stint was in 1982, back when jury duty lasted two full weeks and even if you got on one case, you had to stay the whole time, or longer if you were called for a second case. This was still the case in 1987, the next time I was called. So twice I got out of work for two full weeks, got paid in full by my company, read a lot of books and made new friends. And back then there were no computers, wireless or otherwise, to keep a person in touch with the office. Times have changed since then. Now jury duty only lasts a maximum of two days, or one case, whichever is longer, and if they don't need you, they let you know the night before via a recorded message. Last time I served, I was dismissed after only one day. I was called to one panel and seated as part of a jury that was to hear a case of medical malpractice. As a fanatic about anything medical, I was thrilled at the prospect. But I must have looked too pleased and the attorney for the defense dismissed me. The old Essex County petit jury area was in the old courthouse building and lacked modern conveniences. There was one room with a television, another without, and some chairs out in the hallway. It was conducive to reading but not much else, so I always brought a couple of good books. Now they have built a brand new juror assembly area in a two-story addition to the courthouse which was part of a major overhaul of all the whole court complex, thanks to the ambitious and effective County Executive, Joe DiVincenco, or "Joe D" as his constituents call him. A champion of historic preservation (the historic Essex County Courthouse was completely restored under his stewardship) and local parks, he has accomplished a lot so far, with more to come. I have to say the new jury building is a major improvement in the juror experience. I never really minded the surroundings before, as I had my nose in a book the whole time. But it is a much more pleasant, modern atmosphere now, with many more comfortable seats, several large, flat screen TVs in each room, and a separate computer room with individual cubbies and wireless internet access, where we jurors can log in on our laptops and check e-mail, work remotely, or of course, surf blogs and go on Facebook. Many people object to having their lives disrupted by jury duty and try to get out of their task. While, as a creature of habit, I would ordinarily prefer to just go about my daily business, I never try to get out of jury service. I served on three different cases back in the 1980s and it made me realize how important the whole jury system is. I was impressed with the thoroughness of the evidence presented and how seriously everyone on the jury took their duties. No one was voting guilty or not guilty just to get the case over with and get back to their lives. The juries I served on discussed the cases intelligently, seriously and with great sincerity. There were no slackers and everyone took a stand no matter how many people might disagree. Despite differing opinions, we were able to eventually reach a verdict on all three cases. The other part of the experience is that the jurors become close after deliberating a few times. On breaks we often ate lunch together in the cafeteria or even went out somewhere together. We weren't allowed to discuss the case, but we enjoyed getting to know one another. I'm sure some jurors even became friends and kept in touch after the case they served on had ended. Now that the new facility has so many amenities, it may actually discourage the camaraderie that people tended to enjoy during jury duty, as some of us are squirreled away in our cubbyholes working on our laptops instead of chatting. However, there is still a large contingent of people seated at tables near the coffee area, talking and getting to know each other, so perhaps not that much will change after all. I am still waiting to see if I'll be called for a case. I hope in a way that I will - being on a case is always very interesting, and I was sorry not to get on one last time. One thing I do believe is, that everyone should serve on jury duty at least once in their lives. It is important to understand how the process works and realize how essential the services of ordinary people are in deciding the fate of those accused of a crime. My experiences as a juror have taught me that in most cases this process works very well and that if I were ever accused of a crime, I'd feel I was in good hands. It's good to know. Are still in the kitchen sink. Now the telly's on the blink. And moved out to another town. When the video broke down. Don't know why I feel so bad. Is it the weather, or am I going mad? Don't know why I feel this way. Can't cover up 'cause it's obviously showing. I don't know whether I'm coming or I'm going. Should feel happy, should feel glad. The world's going 'round in a state of confusion. I should have never come outside. To cross the other side. It gets worse, the older that you get. No escape from the state of confusion I'm in. State of confusion I'm in. Ever have a day like this? I had one today. As anyone who knows me understands, I like to have a slow start to my morning; I kind of ease into my day. That means that DH gets up before I do, showers, and goes downstairs first, while I sit on the computer and check a few e-mails and blogs before meandering downstairs. (Meandering isn't in this blog title for nothing). But this morning I was rudely jarred from my routine because DH realized that he hadn't put out the recyclable cardboard and newspapers last night, and the truck was already out there trolling around in the neighborhood. He called upstairs to get me to come down and help. So while he was putting out the cardboard, I fed the dog, and then he returned to the kitchen to start getting breakfast ready. Already our routine has been disrupted and once that happens, confusion reigns. We bump into each other in the kitchen, get in each other's way and generally become cranky. All of a sudden we heard a funny noise, and looked over at the coffee machine, which was finishing up its brewing process. The only problem was, the brewing took place without a carafe underneath collecting the coffee. Not only had the coffee spilled all over the counter, but because it had overflowed its little cone-shaped filter, the coffee grounds were overflowing along with it. Apparently DH had gotten distracted by the cardboard emergency and forgotten to put the coffee pot back after he had prepared the coffee to brew. After a few choice words, as everyone can imagine, so we won't repeat them here, the coffee machine was turned off and I sent DH out with the dog to walk her while I tried to repair the devastation. I was just finishing mopping up coffee from under the microwave when he and Diva returned. Breakfast still had to be made and time continued to slip by so that we both were quite late getting to work today. The day progressed somewhat better from that point on but I did not feel quite right all day! In fact, between this and the general disarray of the economy, I am just out of sorts. Yesterday when I heard the stock market had plunged 250 points, it was quite depressing; and today's rally is not encouraging me much. The other day DH did an interesting exercise using Yahoo Finance's ability to graph the stock market index over a very long period. 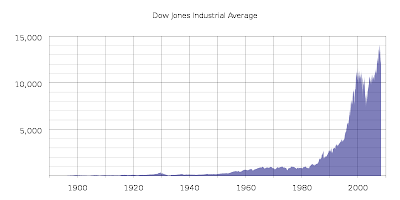 He printed out a chart showing the Dow Jones Industrial average index from 1929 to the present, and then made a straight line along the trend from that time forward, to see where we should be right now if that earlier trend had continued. The result falls around 2,000, about 5,000 points lower than where we are now. He did another version where he took the trend from the early 1980s on, and that projects out to somewhere between 4,000 and 6,000. You see, the problem is, the stock market went along very nicely at a certain general level for years and years, back in the days when a stock was valued somewhat more for its long-term yield in dividends and general value, as opposed to using it as a gambling chip. But all of a sudden, around 1985, the curve drastically changes. The index starts skyrocketing. And the descent that is happening now seems hell-bent on getting back down to the original trend line. If it does, we're going to be in a bad place economically for a lot longer. I couldn't copy the chart that he used but here is a similar one that doesn't go back quite as far but whose creator took the same approach - and this was BEFORE the most recent meltdown. The interesting - or perhaps scary - thing is, when you look at it from the extreme long-term perspective, the Crash of 1929 looks like the tiniest little blip. What's happening now looks more like a roller-coaster ride. So, not only am I in a state of confusion, so is our country. Let's hope tonight's speech by President Obama may calm people's nerves. And in the meantime, here are the Kinks again - singing "Low Budget." The song was from back in the '70s but is so pertinent again now. I've finally posted on my medical blog, Medicana, again. If you're interested in unsual medical conditions, check out my post on "Alice in Wonderland Syndrome." As I'm sure I've mentioned, we are a Saab household. 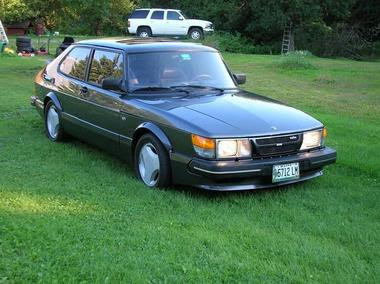 We still have our original Saab 900 that we bought the same year we got married, 1985. It was one of the quirky, personality-filled Saabs that were a cultlike favorite in the 1980s. Saab owners seeing another Saab on the highway would flash their lights. The car above looks generally the same as our 1985; it's a 1986 (which was the same style). Our old girl has 250,000 miles on her and DH still drives her to Philadelphia 3 days a week. Right now the car does need a little work but still doesn't burn a drop of oil and still takes corners as if it is on railroad tracks. Sadly, Saab lost a lot of its distinctiveness when it was bought out by General Motors. We had bought another 900 in 1991 (so for awhile had two nearly identical cars in different colors). But by the time we traded it in, G.M. had taken over the company and had already started their insidious mainstreaming of the Saab trademark. Our 2002 9-5 Sportwagon, while a very nice, serviceable car, doesn't have the same personality. I've always been angry that G.M. didn't appreciate what it had in Saab. Saab was always an innovative company; they perfected their turbo and had gas-sipping 4-cylinder turbos on their high-end model while G.M. still relied on big V-8s that used lots of gas in order to get power. Saab's old motto was "the most intelligent car ever built." By rights, given their legacy of innovation, Saab should have introduced the first hybrid vehicle to take this country by storm - not Toyota. But G.M. had relegated it to a second-rate division among their many divisions and started trying to do the old productivity shuffle - putting Saabs on other platforms, mixing and matching styles. One low point came when they came out with the Saab 9-2 - a "Saab" that most Saab enthusiasts dubbed the "Saabaru" because it was really a Subaru that had been re-badged. But at least Subaru has a certain quirky and independent image of its own and they make good cars. The complete nadir happened when they came out with the 9-7 which was based on a G.M. SUV with a V-8 and lousy gas mileage. It was like the anti-Saab. With the recent disaster that is the U.S. auto industry, G.M. has announced it will phase out Saab, Saturn and most of Pontiac within a short time as part of its restructuring. In aid of this, Saab has filed for bankruptcy in Sweden, in hope that the Swedish government will bail them out enough to make Saab attractive to investors. "With Saab, GM and the Swedish government are saying the other needs to come up with money to keep the brand going. Preuss said $1 billion was needed to keep Saab operating, of which GM was ready to pay $400 million. The U.S. automaker had asked the Swedish government to guarantee the rest. The Swedish government, which insists that Saab's survival is GM's responsibility, rejected the request because GM's business plan wasn't 'realistic,' Industry Minister Maud Olofsson said. More capital is needed to construct a credible and sustainable plan, she said, and 'GM or someone else needs to provide that capital.'" The New York Times has a more positive spin on the story, making it seem as if it was Saab's idea to go bankrupt and implying it might be successful. "Saab went to a Swedish court for protection from its creditors, and said it would — with assistance from the Swedish government — reorganize to pave the way for private investors to buy all or part of the company. After exploring Saab’s options, 'it was determined a formal reorganization would be the best way to create a truly independent entity that is ready for investment,' Saab’s managing director, Jan-Ake Jonsson, said in a statement. Elisabeth Thand Ringqvist, a spokeswoman for the Swedish industry ministry, said Saab would be eligible for help through loan guarantees provided to the Swedish auto industry as part of a support package the government approved in December. 'This could be interpreted as the government supporting Saab in the reorganization phase,' Ms. Ringqvist said. But she said guarantees for working capital, like what G.M. is seeking in Germany, were not on the table. ...dealers said they were optimistic about Saab’s future. 'It’s probably a great time for someone to get a bargain deal on a car company,' said Annette Adams, owner of Iowa City Saab. Her dealership sells about 50 Saabs a year, while her husband’s Saab dealership, Saab Meyer Garage, sells a similar number. She predicted Saab would thrive under new ownership. 'I look for good things to come,' she added. 'We just have to step across the hot coals to get there.'" I hope it works and someone does step up to the plate and invest in Saab. I really would love to see Saab return to its roots under new owners who understand what Saab owners valued about the original Swedish Saabs, and bring that spirit back to the company. As for Pontiac, that's another sad story. They too fell victim to G.M. 's propensity for making all their cars the same. I hope General Motors has learned its lesson or we'll be bailing them out again in a year or two. "Currie confirmed Socks' death Friday evening and said she was "'heartbroken.'" Socks lived to be a ripe old age - estimated at about 18 - and had been diagnosed with cancer late in 2008. He apparently lived a wonderful life with Betty Currie, who clearly loved him and took great care of him. He definitely got a better deal than the Clinton dog, Buddy, who went with the Clintons but, sadly, was struck by a car a year later. Goodbye, Socks, you will be missed. This has been another one of those weeks. Lots of work, no time or energy to blog afterwards. So I am very happy that Bob tagged me for this meme! At least I don't have to choose a subject to blog about when there are so many subjects to choose from that other bloggers are already doing a great job on - for instance, the racist, tasteless cartoon in the New York Post - or the latest news such as the continually tanking economy, or President Obama's trip to Canada. No, instead I can just do this nice, restful meme and not have to think too hard since I have been at work all day and just have no brains left to think with. Grab the nearest book - no matter what it is. Textbook, novel, pop-up book, building code study guide, whatever. Read the 10th word on that page, or the following if that one is blank. Type that word into Google Image search. Tag 4 people and tell them. Link back to this post. I'm not sure if that means Bob's post (herein linked) or mine? Perhaps Bob can elucidate. Since I am sitting in a room with three huge floor-to-ceiling bookcases filled with books, I will need to close my eyes and just point to one on the shelf, as there are a lot of books very near me. I managed to pick out the Images of America - Bloomfield book which was compiled and written by two people in my town, Fred Branch and Jean Kuras, who are very involved in the local historical society, as well as Mark Sceurman, one of the creators of Weird New Jersey (also a Bloomfield resident). It is called "Early Morning Stroll," by Geoffrey Lauder. It was one of the entries in the 2005 Cambridge Camera Club Competition for the POTTERS BAR & DISTRICT PHOTOGRAPHIC SOCIETY. You can find more striking photographs at their website. 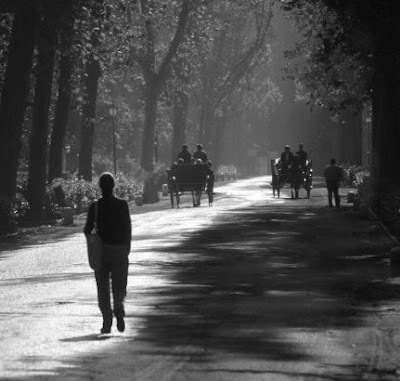 I always like black-and-white photographs the best. They are dramatic, they hold up well and stand the test of time. The same goes for black-and-white movies. We've been watching a series of old movies recently because DH and I were thinking of movie themes to have if we ever ran a movie revival theater. (We have a lot of fantasies like this, which will never happen in real life). We were thinking it would be interesting to show a whole week of "apocalyptic" movies and we thought of Seven Days in May, The Bedford Incident, Dr. Strangelove, On the Beach, Fail Safe and Testament. Yes, that's only six. There are plenty of other ones out there for the seventh. It's amazing how many movies like this were made in the past several decades, due to the ever-present dread brought on by the Cold War. So, being the impulsive (should I say compulsive?) shopper that I am, I got onto Amazon and ordered all of them except On the Beach, which we already own, and Testament, which we have on VHS and I found was discontinued in DVD and only available for $50 (or more) at the time I was looking. So, we started our own little apocalyptic movie showing and have watched Dr. Strangelove, Seven Days in May and Fail Safe, so far. All three were in black and white, and I feel they were stronger and more compelling because of it. If you haven't seen these movies - or if you have, but haven't watched them in a long time - they are definitely worth seeing again with the perspective we have today. Not as much has changed as we'd like to think. The generals all still want to try out their weapons in real wars, there is always a sensible person who wants to prevent war, but is opposed by those who want the war; there is a lack of trust between nations, and Murphy's law applies as much to wars as it does to anything else: If anything can go wrong, it will; and the corrollary, if you think nothing can go wrong, you're wrong. As for Testament, I haven't seen it since the mid-1980s when I watched it for the second time. It stars Jane Alexander and was very well done. Around the same time, a made-for-TV movie called The Day After came out, but it had a much more gung-ho, "we're America and will survive no matter what" kind of ending. Not so with Testament. It is the most devastingly realistic and depressing depiction of what would happen after a nuclear war that I have ever seen. I think I was depressed for a week after I saw it the first time, and the second time I realized I probably couldn't take watching it again after that. So be forewarned if you decide to watch it. It does not have a happy ending, to say the least. I'm kind of adrift today. I took the day off, but my company is working so I don't dare ignore my e-mail. On the other hand, I have no intention of doing actual work, so I have spent the day so far reading blogs, playing around on Facebook (my new addiction) and doing laundry. Oh yes, we also walked the dog. Yes, this dog. 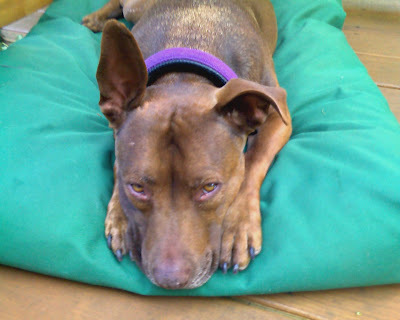 (See below for gratuitous picture of Diva looking cute). Moving along. I am tired of hearing the Republicans whine about the "wasteful spending" in the Stimulus Bill when they have wasted our money for the past eight years and I don't have the energy to actually blog about it so I am going to just post some haiku and call it a day! 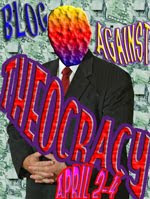 A Series of Haiku Entitled "Republican Thoughts"
Spend it on the poor? Must have more tax cuts! It's the one way to survive! You know that it's true. Hope those of you who are off from work today are enjoying your holiday and the rest of you poor souls are having a quiet day at work! Baxter here. My Female Human and a lot of other People have been Dithering a lot about President Obama's recent Actions or lack thereof. There was the Rendition thing, and the Problems with his Cabinet Appointees who didn't pay their Taxes, and various other Kerfluffles. I say Chill Out, Everybody. I have been watching this Obama Human since the very Beginning; way before my Humans decided to support him, I was on his Side. You know why? Because we Cats can recognize Cat-ness in others. 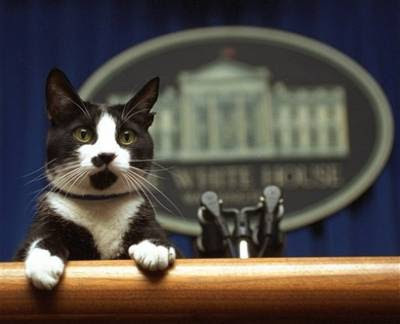 The Obama Human has always been very Catlike. He is kind of a Loner, likes to kind of watch things from a Distance, and takes it all in before making any Big Decisions. This is what we Cats do. You never see a Cat rush in and chase a bunch of Birds like a Dog would. They stalk them. Quietly. Keeping their Cool. Until at the last Moment, they Pounce. The Obama Human is very similar. He managed to play all his Cards right and get Elected; kept his Cool all along. I am not giving up on him. I say that his Delays on things like Don't Ask, Don't Tell and eliminating Rendition are just another Example of his Cautious, Catlike way of dealing with Things. Give him some Time, it hasn't even been a Month yet. Now admittedly, there have been some Bumps in the Road - mainly because he's been trying to be Nice to the Republicans and make them Feel Welcome. This was his one Mistake. He put in all those Tax Breaks into that Stimulus thing, hoping to win over the Republicans. But it was No Dice. And when it finally passed, not one of those Republicans in the House voted for it, and only three in the Senate did. Lesson learned. I think the President will now understand that his bi-partisan Efforts are in Vain and he may as well just do what he Wants without trying to Compromise. I know that's the Lesson a Cat would learn, and this Human seems to be good at learning Lessons. If a Cat is Treated Poorly by someone, the Cat will not deal with that Person again if they can Help It. I think what he was doing Wrong was trying to be too much like a Dog. Dogs can have Packs that are "Teams of Rivals" but it takes a lot of Fighting first in order to establish Who is in Charge. And by that time too much Blood can be shed and it's just not Worth it. And the Head Dog always has to watch his Back or one of the Underlings will Challenge him when he least expects it. Cats want Nothing to do with their Rivals. Sure, a couple of TomCats can come along and sometimes be forced into a Fight, but in general Cats go by the adage, "He who fights and runs away lives to fight another day." We look out for Ourselves and make sure we Get what We Want. Looking Ahead, it's time for the President to make sure he gets what he Wants from now on without worrying about whether those stubborn Republicans are going to vote for it. In the Coming Weeks he has a lot on his List. He plans to address the Foreclosure Crisis, appoint a Health & Human Services and a Commerce Secretary (if all goes Well - Fingers Crossed) and deal with Medicare and Social Security while unveiling the new Budget. Let's hope this all goes more Smoothly than the Stimulus Bill did. In other News, I was Happy when Stump the Sussex Spaniel won Best in Show at Westminster at age 10. It was a great Comeback for this Dog and even though I am not usually Fond of Dogs, as you Know, I couldn't help but have a Warm Feeling when I heard of it. I am no Spring Chicken myself, as I am over Seven Years Old, so it is Nice to know that being Older doesn't keep anybody Down! A lot of People have been making a Big Deal out of the Woman in California who gave birth to Octuplets recently. The Woman, who is Single, had 6 other Kids; all 14 of her Brood were conceived with In Vitro Fertilization. Now People are questioning why the Fertility Clinic would Allow this to Happen and wondering if she could possibly care for Them All. I can't help but wonder too; that's more than most Cats have in their Litters! Sometimes not all the Kittens make it if there isn't enough Food. I hope this doesn't happen for this Woman's Children. "'I didn't think about how we would afford it. I don't really get pocket money. My dad sometimes gives me £10. When my mum found out I thought I was going to get in trouble. We wanted to have the baby but were worried about how people would react. I didn't know what it would be like to be a dad. I will be good, though, and care for it.'" With that I will wish you all a Happy Valentine's Day. I hope I will receive some Catnip for the Occasion! OK, this is bothering me. I have let a few things slide but this is not looking good. According to the NY Times, the current administration is taking the same position as the Bush administration in a rendition/torture case currently before the 9th Circuit Court of Appeals in California. "In the case, Binyam Mohamed, an Ethiopian native, and four other detainees filed suit against a subsidiary of Boeing for arranging flights for the Bush administration’s “extraordinary rendition” program, in which terrorism suspects were secretly taken to other countries, where they say they were tortured. The Bush administration argued that the case should be dismissed because even discussing it in court could threaten national security and relations with other nations. During the campaign, Mr. Obama harshly criticized the Bush administration’s treatment of detainees, and he has broken with that administration on questions like whether to keep open the prison camp at Guantánamo Bay, Cuba. But a government lawyer, Douglas N. Letter, made the same state-secrets argument on Monday, startling several judges on the United States Court of Appeals for the Ninth Circuit. 'Is there anything material that has happened' that might have caused the Justice Department to shift its views, asked Judge Mary M. Schroeder, an appointee of President Jimmy Carter, coyly referring to the recent election. 'No, your honor,' Mr. Letter replied. Once more, he said, 'No, Your Honor.' The position he was taking in court on behalf of the government had been 'thoroughly vetted with the appropriate officials within the new administration,' and 'these are the authorized positions,' he said." Adding this tidbit of information along with the fact that the executive order banning torture continued to allow rendition results in a very concerning situation. Needless to say, the ACLU is very unhappy, according to the article. And so am I. We need to let President Obama know that this is unacceptable. Although the administration's spokesperson says this defense won't be used a lot, it should not be used at all when it comes to criminal acts peformed by our own government. "A Justice Department spokesman, Matt Miller, said the government did not comment on pending litigation, but he seemed to suggest that the Obama administration would invoke the privilege more sparingly than its predecessor. 'It is the policy of this administration to invoke the state secrets privilege only when necessary and in the most appropriate cases,' he said, adding that Attorney General Eric H. Holder Jr. had asked for a review of pending cases in which the government had previously asserted a state secret privilege. 'The attorney general has directed that senior Justice Department officials review all assertions of the state secrets privilege to ensure that the privilege is being invoked only in legally appropriate situations,' he said. 'It is vital that we protect information that, if released, could jeopardize national security.' "
The article goes on to describe treatment during the rendition of the plaintiffs that certainly qualifies as torture - with no if's, ands or buts. (How would you like to be cut all over your body, including your personal parts, and have a hot stinging liquid then poured over you? Personally, I call that torture. Oh yes, and there were the beatings and threats of death too). I can't imagine that exposing these crimes to the light of day will violate any state secrets other than the not-so-secret fact that Bush and his cronies allowed our nation to torture prisoners. This case should not be dismissed and the culprits who perpetrated this crime should be brought to justice. And we all know who they are. Thanks to Annette for "talking me down," as Rachel Maddow would say. In the comments section, she points out that the attorney, Letter, is left over from the Bush administration and it's possible that the Obama administration is just a tad busy right now. So let's keep a close eye on what develops once everything is in place, Eric Holder is Attorney General, and the President and his new administration have more time to start undoing the damage done to our country by Bush and his henchmen. Politics After 50 has a post about this same issue and it heightened my original concerns about it. 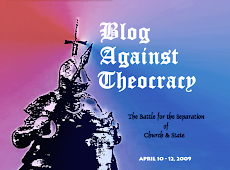 Especially check out her links to other articles on this subject. We really do have to hold his feet to the fire on this one. The honeymoon has been very short and I guess it has to end. To the barricades! An Award with a Meme! Thanks to Spartacus for this lovely award! I am honored to receive it and will do my best to pass it on. Because not only is it an award, it is also a meme! It comes at a good time for me as I am really fed up with thinking about the three-ring circus that is our Congress these days, which is unable to pass a stimulus bill without either loading it up with pork (the Democrats) or insisting nothing will do but more tax breaks (the Republicans); and as a result, nothing is getting done and the final version will be a watered-down thing that is "neither fish nor foul nor good red herring" as the old saying goes. Those who receive this award are required to talk about five addictions they have, and then of course bequeath the award to five other bloggers. This is very easy for me because I tend to be a rather addictive personality. In the past I have smoked cigarettes (gave it up in 1981 after about 9 years of smoking a pack and a half a day); drunk a lot of wine (as well as other alcoholic beverages) - gave that up four years ago when I was diagnosed with a very early case of tongue cancer; and I struggle with my weight (unfortunately I can't just give up food completely; quitting an addiction is much easier than cutting down). Luckily for me, blogging came along just about the same time I quit drinking, so I was able to channel my wish for wine into something else which is a lot more mentally constructive! 1) Blogging. Like many of you, I'm sure, I find blogging (including posting, reading and commenting) to be very addictive. When I am away from a computer for any length of time I feel bereft and at loose ends until I can get on-line again. I first discovered the whole world of blogging when, at our annual neighborhood block party, a new neighbor told me she had a blog. I was fascinated. 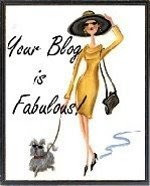 I had heard of this blogging phenomenon but hadn't even read any blogs, let alone thought of writing one. So I checked out her blog (which is Finslippy) and was highly impressed. It was funny, it was poignant, it was well-written, and she got tons of comments on it. (She has also been written up in the newspapers and been featured on TV). I had always loved to write - I was a journalism major in college and kept journals for quite a few years - and here was a new medium to write in. So I started this blog, and then in a fit of irrational exuberence, my medical blog Medicana and my travel blog that so far only has one real entry in it. I discovered the hard way that the easiest thing to do is have a general blog where I can just express opinions and whatever else I want to write about. Writing about subjects that require research and actual work take up a little too much time for me right now! So I've been pretty much sticking to this blog for now, but someday when work doesn't get in the way I will try to go back to the other two as well. 2) Food. Yes, food is necessary for life. But there are two kinds of people in the world: Those who eat to live and those who live to eat. I seem to fall into the latter category. I wasn't always this way. When I was a kid, I really couldn't care less if I ever ate anything. My family worried that I didn't get enough nourishment and I was required to sit at the table until I finished my dinner. It was a battle of wills with my mother, since I would sit there for two hours dawdling over my meal well after she and my father had left the table. It didn't help that she let me read while I ate dinner. Finally I would get tired of the whole thing, shovel in the stone-cold food and get up from the table. I was also a very picky eater. I didn't like anything mixed together. The meat, the potato and vegetable had to be separate on the plate, not touching, or I'd be grossed out. I didn't like fish, certain vegetables (like anything but green beans, really) or lima beans, which I consider in a class of their own (still don't like those). I'd eat chicken or beef and baked potatoes. That was about it. I did have certain odd exceptions. My mother used to make beef tongue in her pressure cooker and I liked it. I liked it because I had no idea it was a real tongue; I thought that was just what they called it. We seldom had any ethnic food, not even Italian. My mother grew up in New England and cooked plain stuff. Her idea of eating Italian food was to get one of those packets of Spatini spaghetti sauce mix (which apparently has been discontinued by its manufacturer, Lawry's, I discovered when Googling it), and follow the directions to make the sauce, mix it with browned ground beef and serve it over spaghetti. It was tasty and was my only exposure to "Italian food" until I was much older. I didn't even eat pizza until I was about 13. We lived in upstate New York at that time and unlike here in Northern New Jersey, Italian food was not as prevalent. Then when I was in college (in Boston) and in my early 20s I started to really like food, food of all kinds. I always liked a good steak, or lobster with drawn butter; but then I began to eat Italian food, stews and chowders and other things that were mixed together. I learned to like Indian food on DH's and my first trip to London in 1983 when we discovered a little hole-in-the-wall place called Motijheel, which serves up fragrant, spicy curries and is still there today. It serves until late at night and is a haven for the local London University students, who come in and have a beer while they're waiting for their takeout food. We ate there last time we were in London a few years ago and it is as good as ever. Sushi didn't come until a bit later, but once I tried that it became another addiction. Thai food came next; there are several excellent restaurants in my immediate area and we go to them regularly. I could go on, but you get the picture. And of course since DH and I both work full-time, we tend to go out to eat a lot. When we cook at home, we try to make it fish (we love salmon, tuna and swordfish in particular) to make up for all the fattening and less healthy stuff we tend to eat when we go out. 3) Coffee. Yes, this is a definite addiction, complete with withdrawal symptoms. I once tried to give up caffeinated coffee because I was having some heart palpitations and thought it might be from the caffeine. I discovered that going to decaf meant I got a terrible headache for three solid days after my last cup of caffeinated coffee. Nothing would help it. And then when the headache went away, I still felt as if I never completely woke up. This went on for six months, until I finally decided it didn't really make any difference in my heart palpitations (which were harmless ones anyway) and I really hated not drinking real coffee. So I threw out my decaf and went back to regular coffee. I have at least 3 cups a day and feel great about it, especially since the medical world keeps finding that caffeinated coffee actually is good for you. I like espresso and cappuccino but there is nothing like a good cup of strong coffee with one spoonful of sugar and half-and-half. Yes, it has to be half-and-half. Milk is tolerable but anything less is not. I'd rather drink it black than with skim milk or even 2%. 4) Ice Cream. This is a fairly recent addiction for me. I used to be sipping my red wine after dinner and feel satisfied. Now when I finish dinner I want a little something sweet. In the summer this means ice cream. My favorite flavor is coffee but I also love mango ice cream (which is not easy to find) and even pistachio now and then. When we go out for sushi I have to have the green tea ice cream afterward but I haven't found one at the supermarket that is as good as the one we have at our favorite sushi restaurant. I don't need a lot. I'm not one of these people who will get out the container and just eat it from there. I put my little half-cup serving in the bowl and savor it, a little at a time, until it's gone. In the winter I stop eating the ice cream - it's cold enough without eating that! Instead I'll have one piece of high quality chocolate or a truffle from Whole Foods. 5) Discovery Health. The Discovery Health TV channel. It has such wonderful shows as "Mystery Diagnosis," "Diagnosis X," "Dr. G, Medical Examiner" and a whole bunch of shows about plastic surgery and other fascinating and ghoulish subjects. I bypass the ones about people giving birth to large numbers of babies and following their lives, and have no interest in the lives and times of the Duggars and their 18 kids. But I love watching the medical ones and trying to figure out the proper diagnosis. Sometimes I find myself yelling at the screen "Will you PLEASE go see a neurologist!" (or an endocrinologist, or gastroenterologist, as the case may be) to some of these people who keep going back to the same general practitioner despite tons of horrible symptoms that refuse to get better. Other times I yell at the program "Check your vitamin B12, you moron!" I am always gratified when I pick the right diagnosis. Of course sometimes it's some rare genetic anomaly that no one has ever had before so I can be excused for not figuring it out. My husband gets tired of watching these shows so I usually only inflict them on him occasionally; or I switch to one after he falls asleep. It's my guilty little secret. So those are five of my addictions. I'm sure I could come up with more if I gave it further thought but I only need five, so I'm done. The Buck Actually Stops Here! Yes, the whole Daschle thing has been a mess, and as many have already reported, he finally withdrew his name from consideration today. "'And, I take responsibility for it and we're going to make sure we fix it so it doesn't happen again.'" "'Ultimately, I campaigned on changing Washington and bottom-up politics,' Obama said. 'And I don't want to send a message to the American people that there are two sets of standards -- one for powerful people and one for ordinary folks who are working every day and paying their taxes.'" In eight years, W never admitted anything he did was a mistake. Oh yes, at the very end he said he shouldn't have done the "Mission Accomplished" thing. Made him look bad, you see. And that flyover thing during Katrina - bad PR move, but what else could he do? Not really his fault. Sending thousands of our soldiers to die in Iraq when it turned out there were no WMDs? Nope, that wasn't a mistake either. Now we have a president who takes responsibility. What a concept. It doesn't mean that he won't make another mistake; but at least it probably won't be the same mistake. (I'll bet no new nominees will have any back tax issues). And it may also mean that if he realizes a position he has taken is wrong - like, I don't know, say, on gay marriage? - he would admit it and try to rectify it. So far, anyway, it looks as if this is how President Obama operates. That is my hope, at least. And since it's only been two weeks since the inauguration, I think we can continue to hope! And this certainly is an improvement over what we had for the past eight years. Oh, come on...Who are you kidding? First it was Timothy Geithner, now it's Tom Daschle. Yes, I'm talking about failure to pay taxes. In the most recent case, the administration refers to Mr. Daschle's failure to pay over $100,000 in taxes from the previous 3 years a "serious mistake." But is it really just a "mistake" if Daschle didn't ask his accountant to look into it until 2008 when he owed the taxes for the car and driver he was using starting in 2005? Or was it more like "Hmmm, Obama might win this thing and since I'm a close adviser of his, maybe I'd better get that little tax issue in order in case I'm nominated for something." What I don't understand is why all of these people who are clearly in public life are always turning up with back taxes they owe, or an illegal housekeeper, nanny or some other snafu, whereas we ordinary folk manage to pay our taxes and not hire illegal aliens. You'd think people in public life would be more careful, not less. It is a mystery. There are other issues with Daschle as well - as Jolly Roger points out, there are other aspects of Daschle's more recent career that may pose a conflict of interest for him to deal with the healthcare industry. I understand President Obama's wish to support Daschle but I would like it if Daschle had the honor to bow out and let someone else with less baggage take the position. Surely he's not the only person around that could handle Health & Human Services. There is another thing this week that is troubling me and I hope it's only temporary. Despite ordering the closure of Guantanamo, apparently President Obama is not going to end the practice of rendition. If, as he has said, we will no longer torture prisoners, what then is the reason to keep this practice? What will be done secretly to prisoners who have been spirited away to some other country that can't be done openly? Let's all make sure to send President Obama a message on his website asking him to end this immoral practice immediately. I'll end this with a few haiku since I haven't done any in awhile! Six more weeks to go. Like the Energizer Bunny, He Keeps on Going! I wrote about him the day after Armistice Day in November of 2007. His name is Frank Buckles, and he is the last World War I veteran left in the United States. He just turned 108 today and is still telling stories of his long life. Born in 1901 when most people got around with horses and buggies, he has seen all kinds of progress in his lifetime - and even has his own web page. His story confirms what I've figured all along - in order to live to be old you have to choose your relatives well. His father lived to be 97 and relatives on his mother's side lived to be 100. According to the Philadelphia Inquirer article linked above, he smoked "a pound of pipe tobacco and a box of cigars" each month until he was in his 70s. The idea of living to such an old age is fascinating to me. It seems as if, as long as a person is in good health as Frank Buckles is, it would be amazing to be able to look back on what changes have taken place in just one lifetime. As it is, I enjoy reminiscing about such obsolete things as mimeograph machines, carbon paper and onionskin paper for copies, 45s that played on a record player with a thing you stuck in the middle to fit the larger hole in the middle of those records. This man remembers trying to teach his father how to drive a Model T and having his dad forget the car wasn't a horse and yell "whoa" instead of stamping on the brake, with predictable consequences. The really amazing thing to me is that "he can remember talking to his grandmother, born in 1817. His grandmother, in turn, could remember talking to her grandfather, who had been in the Revolutionary War." That boggles the mind. My mother likes to point out that she remembers talking to her grandmother who was born in 1832, and no doubt talked to people who had been in the Revolutionary War too. It is thus that real history is preserved, and when people like Frank Buckles pass on, we lose that human relationship to history. Frank Buckles has given a number of recorded interviews which can be found on this Library of Congress Veterans History website. But so many of us forget to ask our elderly relatives to tell us their stories, and once they're gone we never have that connection to history again. For instance, my grandfather, who was in his mid-40s before he fathered my mother and aunt, was born way back in 1872, only seven years after the Civil War ended. No doubt he grew up hearing many personal experiences of that war but I never heard him talk about those stories. It would have been interesting to hear his perspective about that war and the experiences of people who actually lived through it. My mother was born the year the First World War ended so although she was not around during the war, she did hear a lot about World War I from local residents who were veterans, and grew up reading a lot of novels and other books that referenced the "Great War" as it was known then. As a result she grew up with her own impressions about that war and passed her interest in it on to me. My father did not serve in either World War. He was too young for the first, and although he could have served in World War II he was exempt due to his tendencies to nervousness and depression. 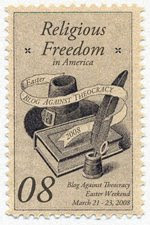 He worked instead in the Office of Censorship reading and censoring German prisoners' mail, since he had learned German in school. But he did often reminisce about the past - particularly about FDR (he once saw President Roosevelt drive by in the Presidential Cadillac and never forgot it). My brother-in-law, on the occasion of Dad's 90th birthday, videotaped an interview he and my sister had with him, asking him all kinds of questions about his life. I have a copy of it and it is great to be able to listen to his stories of the past. I must make an effort to do the same for my father-in-law (who served in World War II and was in the 5th Army as it marched through Italy in 1944-45) and my mother and aunt, who have seen so much history in their own lives. I've talked about it before but somehow never get around to it, and time is slipping by. So do go to the Veterans History website and listen to Frank Buckles' stories. And ask your own elderly relatives to tell you theirs, and record them. It's one way we can remain in touch with history - and as you know, if we don't learn from history we are doomed to repeat it.